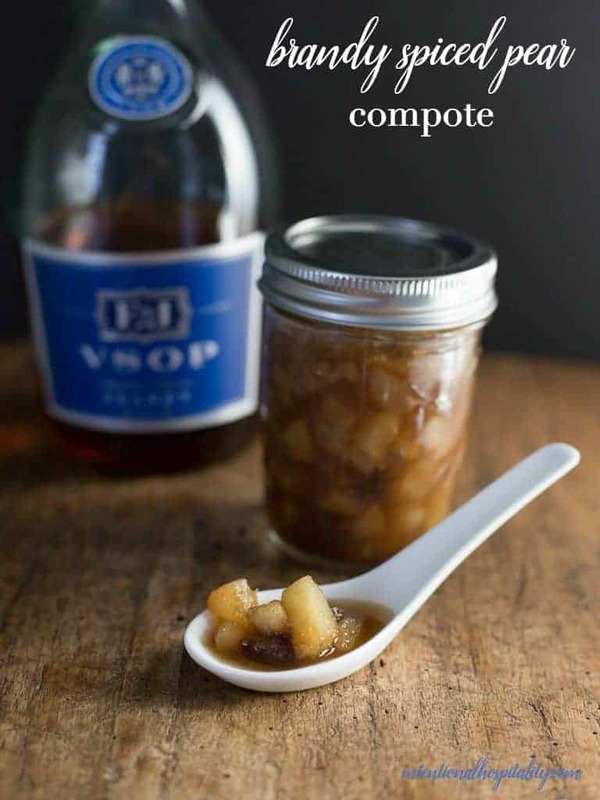 The combination of pears and brandy together create an elegant and delicious compote when you make this Brandy Spiced Pear Compote Recipe . Warm the compote and serve over ice cream for a special dessert that your friends and family will all enjoy. If you would like to create a unique appetizer that will have your guest saying wow, try placing compote on top of brie, wrap with filo dough and bake until golden brown. For a main dish serve as a side condiment for roasted pork, beef or grilled chicken. For a simple but elegant side dish try roasting vegetables such as acorn squash then during the last 15 minutes of cooking place a generous size dollop of this recipe for brandy spiced pear compote in the center of the squash. The sauce will bake into the squash adding a sweet brandy flavor. Just before serving drizzle warm honey over the compote topped squash. To make canning the compote quicker I used a Prepworks vegetable and fruit chopper. I just pealed the pears, sliced in half and cored. Then I placed on chopper and pushed them through, perfect little cubes super fast! The combination of pears and brandy together create an elegant and delicious compote when you make this Brandy Spiced Pear Compote. Wash pears and lemon under cold running water, scrubbing well. Peel, cut pears in half then core and dice into cubes. Ladle hat compote into hat jars leaving ½ inch head space. Remove air bubbles. Wipe clean the jar rims. Let jars cool 5 minutes. Remove jars from canner and allow to cool 12 hours before removing rings. Test seals, label and date. Store in a cool dry place.